Ipswich Borough Council has rolled out the National Food Hygiene Rating Scheme in partnership with the Food Standards Agency. The scheme has been set up to help you choose where to eat out or shop for food, by giving you information about the hygiene standards in restaurants, pubs, cafés, takeaways, hotels and other places you eat, as well as supermarkets and other food shops. When you eat out or shop for food, look out for a sticker in the window or on the door, or a certificate on display, showing the hygiene rating and date of last inspection. Although businesses are not required to show their rating, they are encouraged to display them in a place where they can easily be seen. If you don't see the rating at a takeaway or other food business, you can ask a member of staff if the business is in the scheme and what rating was given at the last inspection. Alternatively, you can search for the rating on the Food Standards Agency website. A Food Safety Officer from Ipswich Borough Council will inspect a business to check that it meets the requirements of food hygiene law. A new rating is given each time the business is inspected and how often inspections take place depends on the risk to people's health. The greater the risk, the more often the business will be inspected. If a business owner or manager makes improvements to hygiene standards, they can request an additional visit in advance of the next planned inspection. 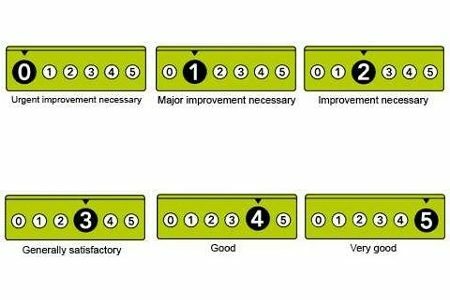 This means these improvements can be checked and a new rating could be given sooner. The hygiene standards found at the time of inspection are then rated on a scale. At the bottom of the scale is '0' - this means urgent improvement is required. At the top of the scale is '5' - this means the hygiene standards are very good. The rating shows how well the business is doing overall. The business may do better in some areas and less well in others and the rating takes this into account. This includes those areas that need improving the most. The officer will explain to the person who owns or manages the business what improvements need to be made and what action they can take to improve their hygiene rating. Any businesses given ratings of '0' or '1' must make urgent or major improvements to hygiene standards. The Food Safety Officer will use a number of enforcement tools as well as giving advice and guidance to make sure these improvements are made. If the officer finds that a business's hygiene standards are very poor and there is an imminent risk to health - this means food is not safe to eat - the officer must take action to make sure that consumers are protected. This could mean prohibiting part of an operation or closing the business down. If a new business has been set up, or there is a new owner, it will not have a food hygiene rating straight away. However, it may display a sticker or certificate that says 'Awaiting Inspection'. A rating will be given as soon as a Food Safety Officer has inspected the business. If you want to know more detailed information than just the rating that has been awarded, you should make a Freedom of Information request to see the Food Safety Officer's inspection report, using the contact details on this page. If you are worried about a rating that has been given to an Ipswich venue you should let us know immediately. If you are the owner of a business and you think that you have been given an unfair or wrong rating you should first talk to the Food Safety Officer who inspected your business about why the particular rating was given. To submit an appeal you should download an appeals form and complete and return to the address shown at the bottom of the form within 21 days of receiving your rating (this includes weekends and public holidays). The owner or manager of the business in question also has a 'right to reply'. This is different from an appeal. A right to reply form is used to tell the Food Safety Officer how the business has improved its hygiene or to explain any unusual circumstances at the time of the inspection. The business's right to reply will be published online with its hygiene rating. As the food business operator of the establishment you have the right to request re-rating inspections if you have taken action to rectify the non-compliances identified at the time of the initial inspection. You must provide details of the improvements made with your request, including supporting evidence where appropriate. The cost of each re-rating inspection is £120. If we consider that you have provided sufficient evidence that the required improvements have been made, we will make an unannounced inspection within 3 months of receipt of your request. We will give you a ‘new’ food hygiene rating based on the level of compliance that is found at the time of the re-rating inspection. You should be aware that your rating could go up, down or remain the same. To request and make payment for another inspection, please complete the re-rating inspection request form. You can read more about the appeals, right to reply and repeat inspection processes in a PDF on the Food Standards Agency's website.